A great Finial with lion masks carved in relief of antique origin, decorated with drapes and fruits. 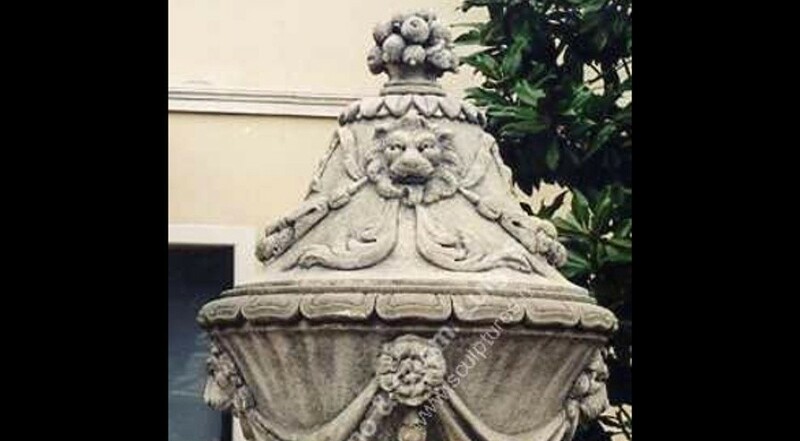 The top finial with elegant little fruit masks with lion head mask as for the central round piece. A carved rosettas, imperial style with the garland drapes with ovules, leaves and simple geometric design. Late 18th Century, original design maked several years ago for a private clients in the north of England. Nice a pair of these finials to be put on the entry way of Residence or on gate. Finial is the perfect garden ornament for a formal garden gateway, perhaps to a walled garden.